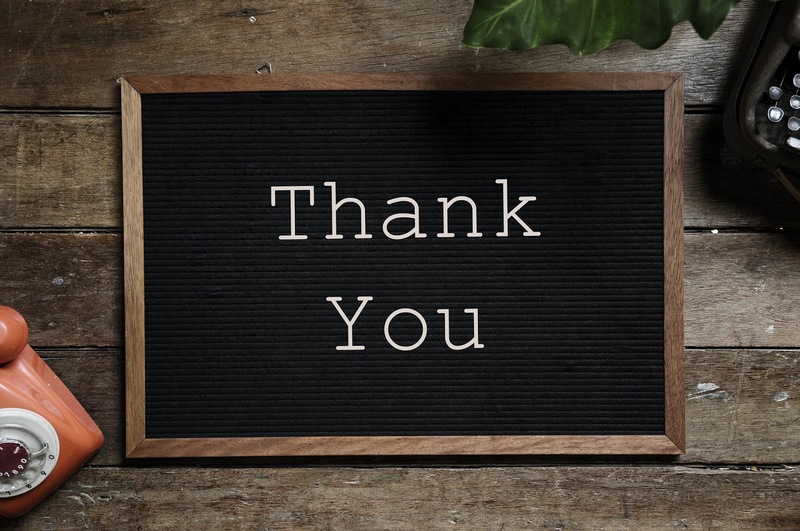 I cannot express enough how kind and generous fellow genealogists, researchers, and family historians can be. 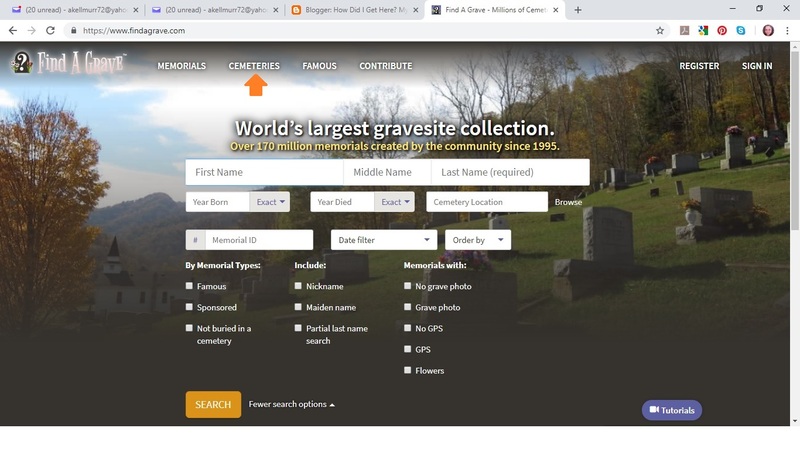 This week I decided to pay a visit to the Find A Grave website to see if there were any updates to one of my ancestral places, the area around Riverdale, NC. I saw the results of all the hard work that fellow researcher Nathaniel Glasgow had completed last year. 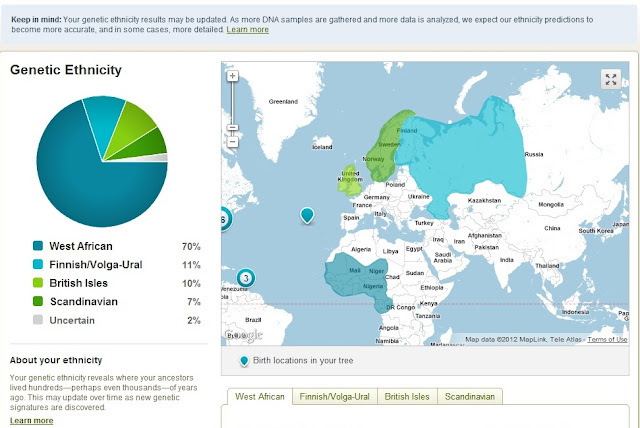 He and I had connected last year via my blog post that had I had written about how I learned that my maternal 3rd great grandfather Mortimer Mitchell had worked the lands of Col. Peter G Evans from about 1860--1864. 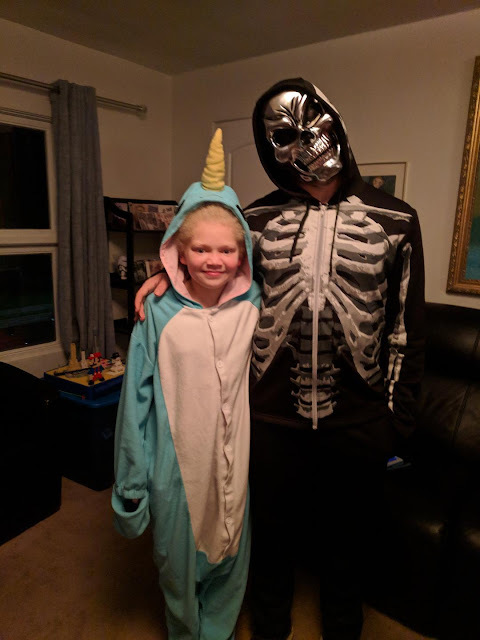 You can check out that post here. 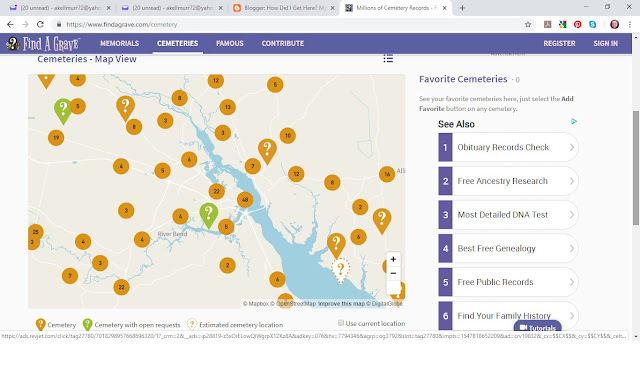 Nathaniel traveled around Craven County, NC photographing old cemeteries and uploaded his work to Find A Grave. Now you are probably wondering how this helped me figure out Mortimer Mitchell's neighborhood. Let me show you. Small family cemeteries are located on private property. Who's property? Well right now I couldn't give you the specifics of who owns these plots of land. What I do know is that back in the day, a family owned the land that the family cemetery was placed on. In my post Mortimer Mitchell Worked on the Lands of Peter G. Evans , I featured pages from the 1860 federal census for Goodings, Craven, NC. This area is now referred to as Riverdale. By going through the pages of the census, I learned the names of my 3rd great grandfather's neighbors. Three of the names were Tolson, Hardison, and Williams. 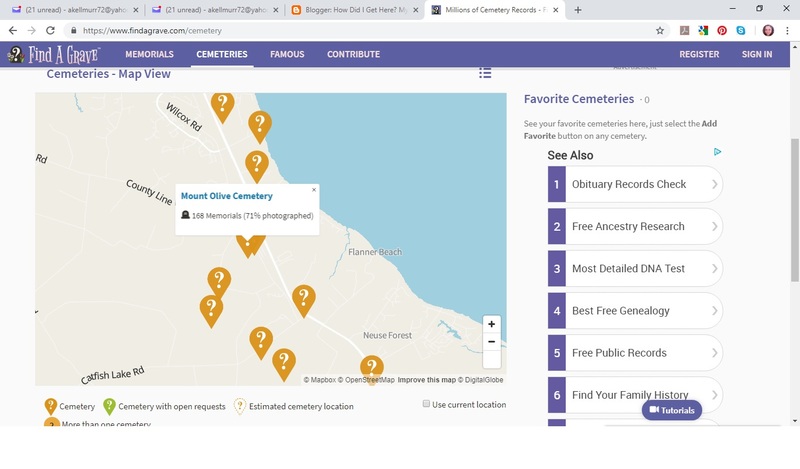 Here's where Find A Grave helped me out a bit. If you go to the site, you arrive at this page. 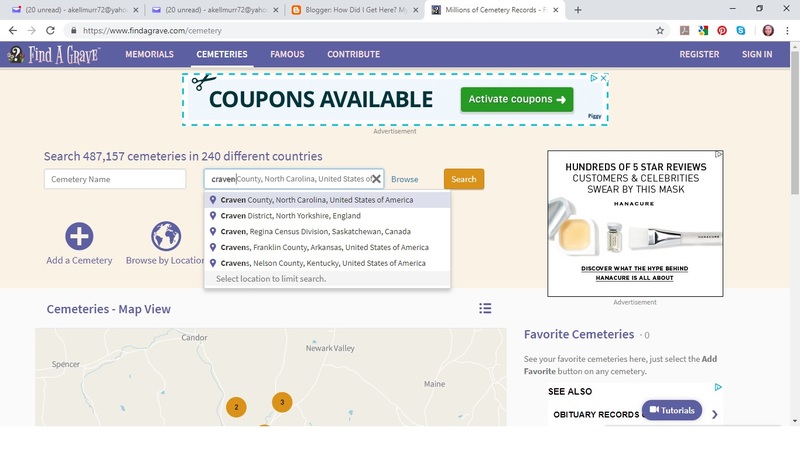 Step one --Click on Cemeteries. Step two --Type in area of country you are researching. I typed in Craven County, NC. After typing this a drop down choice appears with the area I had typed in. Step three --Click on the drop down selection. Wait a moment after doing this so the map featured below this window can update. It will do this without you having to hit search. 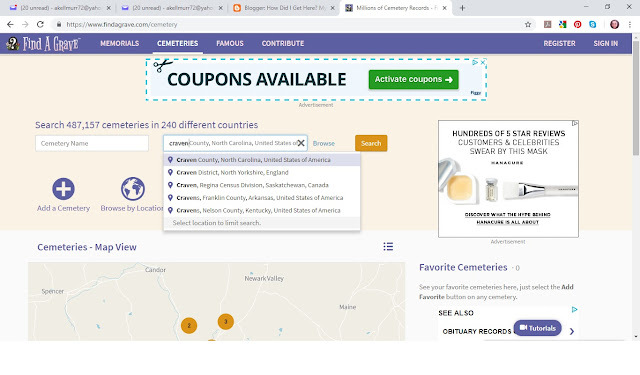 After the map updates to show the chosen location you can zoom in closer and you will find it will load even more cemeteries. I zoomed in closer and moved the map over to the area of Craven County, NC that shows where I know my Mortimer Mitchell owned land. His property was on Tebo Rd. 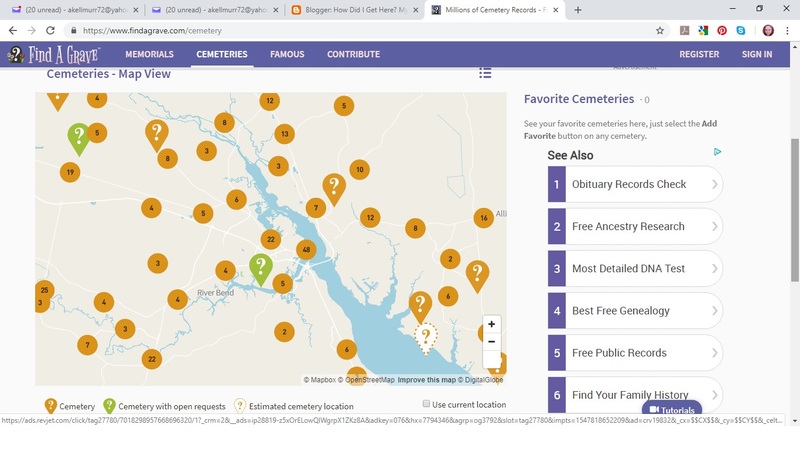 Each one of those question marks is a cemetery location. When you click on a question mark it will reveal the name of the cemetery. Mount Olive Cemetery is where my ancestors are buried and it is located not far from where Mortimer Mitchell's property was. I took this information and plotted it on Google Maps to get a better visualization of what was going on here and here's the result. Mortimer Mitchell's land I've noted as point G. The cemetery to the left of this land, Chestnut Cemetery, is where members of the Hardison family were buried. If you are new to my blog, you can read about how Mortimer Mitchell purchased his land from the widow of Gabriel Hardison here. Gabriel's widow, who was born Elizabeth Tolson went on to marry Robert Williams in 1872. Robert Williams is buried in the Williams/White Cemetery. The family of Michael Nelms Fisher is buried at the Fisher Cemetery. Michael Fisher owned David Sampson who was the husband of my 2nd great grandmother's sister, Mary Jane Mitchell Sampson. 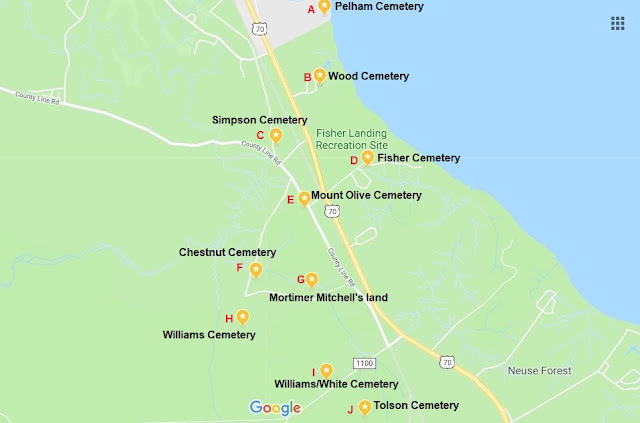 The Pelham Cemetery is noted as point A on this map. Another sister of my 2nd great grandmother, Margaret Mitchell Pelham Thompson, was married to Alonzo Pelham. 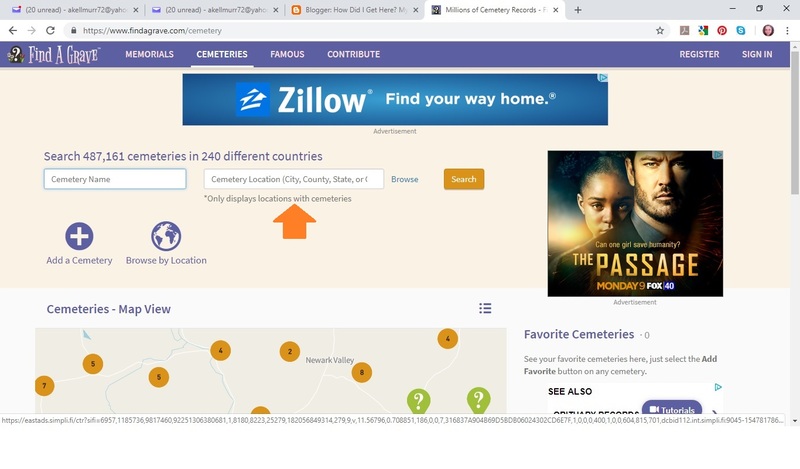 The location of this particular cemetery may give indication of the area where Alonzo was born. This map definitely gives me a better understanding of Mortimer Mitchell's neighborhood. I've been doing some more digging and have some updates for the map I created. I'll share that in an upcoming post. 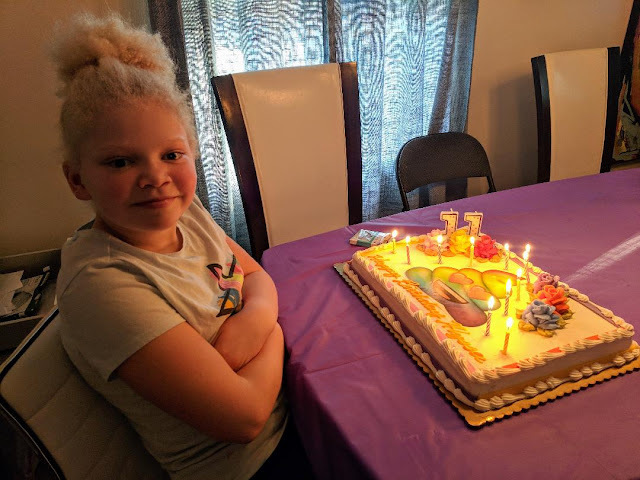 I never did this! I'm so glad you took us step by step and I will now be trying it out. Thanks!